Carlisle House Bed and Breakfast is conveniently located near Dickinson College, Dickinson School of Law, and the Army War College. If you are visiting any of these schools with a prospective or current student, Molly’s Garden may be just the accommodation for you. 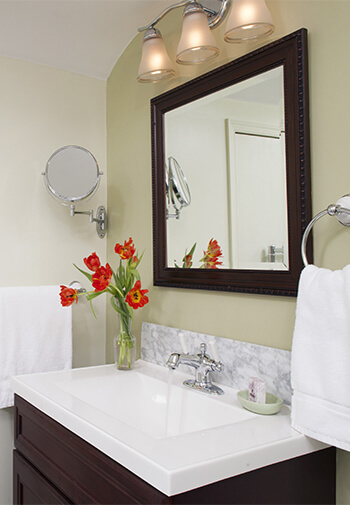 This thoughtfully appointed guestroom has two queen beds and a private bathroom with 5-ft multi-jetted shower. Double Occupancy rates for this room vary from $159 to $229, according to the season. Up to 2 additional guests can be accommodated at $25 to $35 per guest, according to the season. If you prefer not to book online, please call us at 717-249-0350 or email us at Info@TheCarlisleHouse.com. Named for Carlisle’s heroine Mary Hays McCauly, commonly known as Molly Pitcher, the spacious 3rd-floor front room has windows that look out toward the old Carlisle Graveyard in which she was buried. It features two decorative iron queen beds enhanced with Williamsburg accessories, soft cherry furniture, a comfy loveseat and work table area with telephone, Ethernet and wireless Internet connections. 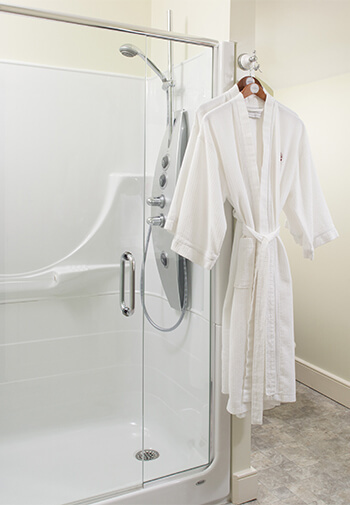 The bathroom includes a five-foot shower with seat and a Grohe Aquatower multi-jetted shower unit.